The first documented European exploration of what is now Wood County took place in the late 18th century, when Pedro Vial, was sent on expeditions by the Spanish governor of Texas. After marching all the way to Santa Fe in 1787, he headed east to Natchitoches. The following year, he passed through today's Wood County on his way back to San Antonio. There is some archeological evidence to suggest that a French trading post stood along Mill Race Creek in the early 1700s near the site of the modern town of Hainsville. It is also thought that the French may have build a military post called Fort Ledout near Black Oak in Wood County. However, other than the archeological evidence, little is known about any possible French settlements. An important archeological discovery made by a hunting party in 1887, southeast of Hainsville and north of Bromley, suggests that Native Americans may have engaged in a battle either between different tribes or with the Spanish. Despite finding many relics, including a cross, tomahawk pieces, a Spanish coin, and several broken muskets, there is no written record of any such encounter. Some Spanish and Mexican land grants were issued in the area, but settlement was sparse until after the Texas Revolution. The first white settler was Martin Varner. He built his home near the southeast side of what is now Hainsville at least by 1824. The first organized settlement was at Webster in 1845. 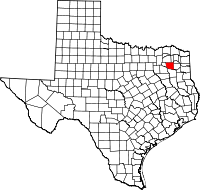 In 1850, five years after Texas was annexed to the United States, the Legislature authorized the forming of the county from Van Zandt County. In 1849, residents of what was then Van Zandt County north of the Sabine River, petitioned the Legislature for the county to be reorganized. Reasons included that the majority of the population lived north of the river, and that travel to Jordan's Saline, then the county seat, was difficult in winter. Wood county was created and Van Zandt was reorganized with territory from adjacent counties. Early industry included a number of sawmills, gritsmills, steam mills, and cotton gins. A jug factory operated north of the Big Sandy Creek in the 1850s. A second jug factory was built some years later near Holly Creek. Two brick kilns are known to have been located in the area of Winnsboro. A furniture company, Wigley Furniture Company, begain operating in Mineola in 1874. A cane and raw-hide bottom chair factory opened in 1886. Tie-cutting became a major industry in the county in the 1870s with the coming of the railroads. Pine Mills, Perryville, Ogburn, Merrimac, Peach, and Fouke got their start as sawmill towns. Wood County had only 17 slaves by 1850, but that number ballooned ten years later to 3,963, estimated at about 20 percent of the population. Wood County voted for secession by a 70 percent majority. However, the two delegates to the Secession Convention both opposed secession. The first soldiers raised for the Confederacy in Wood County were Company A, 10th Texas Cavalry Regiment. A training ground called Camp Flournoy was established east of Quitman. Another company called the Wood County Rebels was formed on August 5, 1861. They then requested active duty as cavalry. The Texas and Pacific Railroad came through the southern portion of the county in 1873 and formed a junction with the International and Great Northern Railroad at Sodom, which was later renamed Mineola, on a Longview to Dallas route. The railroads came to the northern portion of the county in 1876 when the East Line and Red River Railroad laid track from Jefferson to Greenville. This segment later was absorbed by the Louisiana, Arkansas, and Texas Railroad. The Texas Shortline Railroad also ran between Alba and Grand Saline in Van Zandt County. Coal was discovered in the Alba area in sometime before 1900. The operating mines were Lignite coal mines. Oil was discovered in Wood County in 1941, and the county produced 25 million barrels of oil per year by 1948. Developed oilfields in Wood County include the Pine Mills Oilfield and the Alba Oilfield. There were a number of so-called "subscription schools" in Wood County after 1854, when free public schools in Texas were on the rise due to legislative action. In 1852, a log school house in the western part of the county near Chaney Crossing on Lake Fork was built. By 1854, school was being taught in Quitman. By 1859, Quitman had three schools that required tuition to be paid. On January 8, 1884, the Texas legislature required the county to be divided into free public school districts. The school districts established by the legislature were Quitman, Lone Star, Myrtle Springs, Forest Hill, Cartwright, Caney, Rock Hill, Forest Home, Winnsboro, Chalybeate Springs, Spring Hill, Smyrna, Cold Springs, Shady Grove, Center Point, Pleasant Grove, Floyd's Common Ridge, Mount Pisgah, Liberty, Sand Springs, Fletcher, Pleasant Divide, Friendship, Lone Pint, Salem, Webster, Permimmon Grove, Cottonwood, Macedonia, Concord, New Hope, Dyess, Mount Enterprise, and "Albia" (Alba). Free school districts for African Americans were established at Quitman, Cedar Tree, Robinson's Chapel, Muddy Creek, Mount Zion, Tranquil, Center, Hawkins, Shiloh and "District 48" which encompassed all of the district west of Lake Fork. According to the U.S. Census Bureau, the county has a total area of 696 square miles (1,800 km2), of which 645 square miles (1,670 km2) is land and 50 square miles (130 km2) (7.3%) is water. The following are municipalities and towns which are incorporated under the laws of the state of Texas, meaning they have elected governments and officially recognized municipal, town, or village governments. The following are towns in Wood County, Texas which are not incorporated but recognized as active settlements through community centers, churches, and similar geographic, historic, and physical landmarks. Wood County previously had a number of settlements. In 1884, there were 35 settlements in the county at which the Texas Legislature ordered schools to be established. Wood County includes the intersection of two major U.S. Highways, U.S. Highways 69 and 80 intersect in the city of Mineola's downtown area. Texas Highway 37 connects Mineola and Quitman off of US 69. Wood County is currently served by Amtrack's Texas Eagle passenger railway line. The railroad tracks which run through the southern portion of Wood County and through Mineola are currently owned and operated by Union Pacific. Wood County is served by three airports located in Mineola, Quitman, and Winnsboro. Mineola Wisner Field: The Airport identifier for this airport is 3F9. This airport was established in 1917. It has been operated by the same family owners since 1926. It is also known as the Mineola Airport and Wisner Field. Wood County Airport (Mineola/Quitman Airport): This airport is a public airport owned by Wood County. Winnsboro Municipal Airport: This airport is located south of the city of Winnsboro and is a municipally owned airport facility. Wood County is in the Tyler-Longview Media Market. It is currently served by two local newspapers, and daily newspapers and television stations from other parts of the East Texas area. Wood County currently has only two newspapers published within its borders. The Wood County Monitor and the Winnsboro News both serve Wood County, although the Winnsboro News also served Franklin County, as Winnsboro is split between the two counties. In August 2016, two of the county's longstanding newspaper operations, the Mineola Monitor and the Wood County Democrat, were merged by their owner, Bluebonnet Publishing. Prior to that, the Mineola Monitor operated under its own masthead in Mineola, and the Wood County Democrat operated under its own masthead in Quitman. Staffing at the newspapers did not change, and the staffs of both newspapers were merged. Serving Winnsboro, the Winnsboro News is a weekly newspaper with no website. In August, 2003, the newspaper gained notoriety for publishing an editorial by publisher Tom Pendergast outing a gay couple living in the city. Wood County is served by two local radio stations. KWNS is a Southern Gospel radio station located in Winnsboro, Texas. It broadcasts at 104.7 FM. KMOO is a radio station located in Mineola, Texas, broadcasting at 99.9 FM. The country music station is currently owned by Hightower Radio. The station was formerly operated by Sam Curry, its founder, who founded the station in 1963. Under Curry's tenure, the station was referred to by its ownership and on air personalities as, "K M Double O," and on air personalities were not allowed to call the station "KMOO," with the last three letters pronounced in a manner similar to a noise made by cattle. Curry sold the station in 1995 when he planned to embark on a race for Wood County Judge as a Democrat, a race he ultimately lost. As of the census of 2000, there were 36,752 people, 14,583 households, and 10,645 families residing in the county. The population density was 56 people per square mile (22/km²). There were 17,939 housing units at an average density of 28 per square mile (11/km²). The racial makeup of the county was 89.11% White, 6.12% Black or African American, 0.55% Native American, 0.20% Asian, 0.02% Pacific Islander, 2.91% from other races, and 1.09% from two or more races. 5.72% of the population were Hispanic or Latino of any race. There were 14,583 households out of which 26.70% had children under the age of 18 living with them, 61.50% were married couples living together, 8.20% had a female householder with no husband present, and 27.00% were non-families. 24.10% of all households were made up of individuals and 13.20% had someone living alone who was 65 years of age or older. The average household size was 2.42 and the average family size was 2.85. In the county, the population was spread out with 21.80% under the age of 18, 7.90% from 18 to 24, 22.90% from 25 to 44, 26.40% from 45 to 64, and 20.90% who were 65 years of age or older. The median age was 43 years. For every 100 females there were 97.10 males. For every 100 females age 18 and over, there were 95.10 males. The median income for a household in the county was $32,885, and the median income for a family was $38,219. Males had a median income of $30,558 versus $20,209 for females. The per capita income for the county was $17,702. About 10.80% of families and 14.30% of the population were below the poverty line, including 20.50% of those under age 18 and 10.30% of those age 65 or over. Wood County is represented in the Texas House of Representatives by the Republican Bryan Hughes, a lawyer in Mineola and a native of Wood County. The county is split between two different U.S. Congressional Districts, the First Congressional District of Texas and the Fifth Congressional District of Texas. Thus, the county is represented by Congressman Louie Gohmert and Congressman Lance Gooden.The county is currently represented in the Texas Senate by Kevin Eltife. The current County Judge, Bryan Jeans, was convicted of driving while intoxicated in 2016. As County Judge, Jeans is both the county's chief administrator and judge of the county court at law, which handles misdemeanor cases. Also noteworthy, the former Sheriff James Arthur 'Jim' Brown and his Chief Deputy William 'Miles' Tucker were arrested in 2017' for abusing their public stations for their respective roles in pursuing a systemic personal vendetta against two area businessmen and their employees. Firstly bringing fraudulent accusations, before progressing to false arrests, then more fraudulent retaliatory arrests in response to civil relief the businessmen obtained, before ultimately planning and unsuccessfully carrying out the murder of said businessmen via agent. In spite of an increasing number of voters in every U.S. Presidential election since 1992, the percent of registered Wood County voters turning out to vote in presidential elections has fallen approximately ten percent between 1992 and 2012. † W-I signifies a "write-in" candidate. ‡ NLP Signifies "Natural Law Party." ৳ UST Signifies "U.S. Taxpayer Party." ₮ IND Signifies "Independent." ₩ LIB signifies "Libertarian Party." ¥ GRN Signifies "Green Party. Portions of the county are served by 11 separate independent school districts, serving students in pre-kindergarten through 12th grade: Alba-Golden ISD, Big Sandy ISD, Como-Pickton ISD, Harmony ISD, Hawkins ISD, Mineola ISD, Pittsburg ISD, Quitman ISD, Union Hill ISD, Winnsboro ISD, and Yantis ISD. Jarvis Christian College is located in unincorporated Wood County, near Hawkins. Wood County is home to a number of historic and natural preservation sites, Recorded Texas Historic Landmarks, special districts, and cities and businesses with special designations from various national and state bodies. Bobby Ray Inman, U.S. Navy Admiral and Defense Secretary Nominee of President Clinton. Graduate of Mineola High School. ^ a b c d e f g h i David W. Gilbreath (June 15, 2010). "WOOD COUNTY". Handbook of Texas Online. Texas State Historical Association. Retrieved May 15, 2015. ^ a b E., CHIPMAN, DONALD (June 15, 2010). "VIAL, PEDRO [PIERRE]". tshaonline.org. Retrieved October 30, 2016. ^ a b "Wood County History". hlrgazette.com. Retrieved October 31, 2016. ^ "History of Van Zandt County Texas". vanzandttx.org. Retrieved October 30, 2016. ^ a b c d e f g h i j Wood County, 1850-1900. Quitman, Texas: Wood County Historical Society. 1976. pp. 7, 8, 19, 20, 32–33, 36. ^ "The Handbook of Texas Online | Texas State Historical Association (TSHA)". tshaonline.org. Retrieved October 30, 2016. ^ "Amtrak's Texas Eagle | Mineola, TX". www.texaseagle.com. Retrieved November 4, 2016. ^ "MINEOLA-WISENER FIELD AIRPORT". www.mineolawisener.com. Retrieved November 4, 2016. ^ "AirportIQ 5010". www.gcr1.com. Retrieved November 4, 2016. ^ "AirNav: F51 - Winnsboro Municipal Airport". www.airnav.com. Retrieved November 4, 2016. ^ a b "Newspaper Merger". Wood County Monitor. Retrieved November 11, 2016. ^ Grimes, Andrea (October 6, 2005). "Over the Edge". Dallas Observer. Retrieved November 11, 2016. ^ a b "KWNS". Streema. Retrieved November 11, 2016. ^ Jones, Lucille (1973). History of Mineola, Texas: "Gateway to the Pines". Quanah, Texas: Nortex Offset Publications, Inc. p. 125 – via University of North Texas Portal to Texas History. ^ "Who Represents Me--Districts By County". www.fyi.legis.state.tx.us. Retrieved November 25, 2016. ^ "Wood County Judge". Wood County, Texas Website. Wood County, Texas. Retrieved November 25, 2016. ^ Staff, KLTV Digital Media. "Wood County judge pleads guilty to driving while intoxicated". Retrieved November 25, 2016. ^ "Staff". Wood County Monitor. ^ a b c d e "HISTORICAL ELECTIONS - OFFICIAL RESULTS". elections.sos.state.tx.us. Retrieved November 8, 2016. ^ "Texas Main Street Communities". www.google.com. Retrieved November 26, 2016. ^ "Texas Treasure Businesses" (PDF). Texas Historical Commission. Texas Historical Commission. Retrieved November 26, 2016. Wikimedia Commons has media related to Wood County, Texas.